MISSISSAUGA, Canada—”More wonderful than I had hoped”—that was Katrina Selby’s impression after seeing the first half of Shen Yun Performing Arts’ matinee show at the Living Arts Centre on April 28. “I was very touched by how spiritual and meaningful they were,” she said of the classical Chinese dance and music performances. She especially found the music “extremely spiritually touching.” “I was in my own thoughts on my way here—I live two hours away—and the music actually touched the subjects I was praying about this morning,” she said. Sung in bel canto operatic style in the Chinese language, Shen Yun’s song texts eloquently speak to people’s universal wish for hope, despite life’s setbacks, and their desire to find their way back to the true purpose of their lives. While listening, Ms. Selby was thinking, “are they talking to me?” since these questions were exactly what was on her mind on her way to the theatre. New York-based Shen Yun has made it its mission to revive the traditional culture of China through classical Chinese dance and music productions that the company takes to audiences around the globe each year. The themes that were so moving to Ms. Selby were in fact the essence of that ancient culture, whose heart and soul is a deep belief in virtue and faith in the divine. 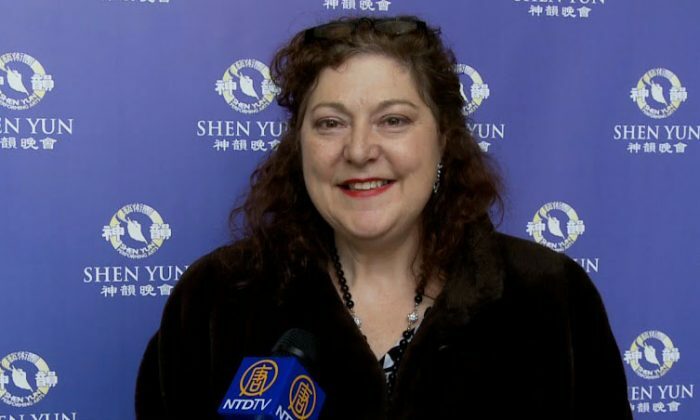 For Ms. Selby, Shen Yun is a very good showcase demonstrating why culture is important and why preserving dance, music, and song is important, and “what it does for us.” It’s “because it’s part of our humanity,” she said. “So as the song said, the technology and modern status and wealth and our society’s pressure to have more, do more, be more, is pretty misleading,” she said. Ms. Selby is herself a tutor in the technical subjects of computers, science, and diagnostics. But at the same time, she is a lover of culture and the arts, and she has been exploring different subjects related to spirituality recently, so the story-based dances and song lyrics that spoke to that theme gave her much food for thought. “I love storytelling, so the fact that so many cultures have similar creation stories makes us similar. We are different but we are similar, and so by being exposed to other stories for people who don’t know Chinese stories, we see that we are the same,” she said. Being a teacher, Ms. Selby also enjoyed the introductions to each piece and to the Chinese instruments in the live orchestra that combines instruments from both East and West. “An explanation made it that much more meaningful,” she said. What is new served its role, as in the state-of-the-art graphics technology behind the richly vivid animated backdrop paired with each piece. “Thanks to the backdrops that are used in the dance presentation, the touch of the metal flowers in the costume, the touch of the sky and the water, so we go out, we take it with us, and then we express it through dance and art and even music to some degree,” Ms. Selby noted. “That’s what arts gives us, that connection to the world and our life experience, so profound,” she said.